The Birmingham Art Music Alliance (BAMA) presents the 2018 Birmingham New Music Festival (BNMF) Thursday, October 18 through Sunday, October 21, 2018. The four free concerts of the 2018 Birmingham New Music Festival feature music by regional composers as well as winning submissions by New York Composers Circle, the result of an exciting exchange program between Birmingham Art Music Alliance and the New York Composers Circle. All events are free and open to the public! 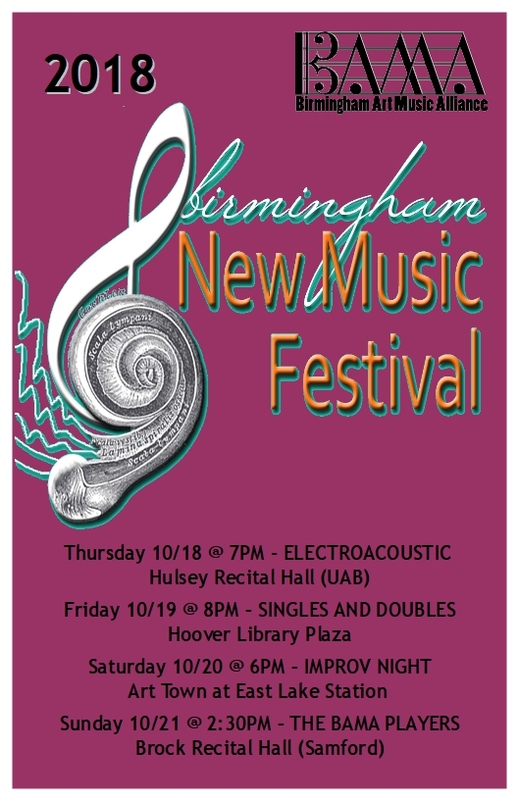 On Thursday, October 18, 2018; at 7:00 PM, join us at UAB’s Hulsey Recital Hall as we launch the fifth annual Birmingham New Music Festival! This concert will feature electroacoustic music by Alabama and regional composers Monroe Golden, Holland Hopson, Joe L. Alexander, Brian C. Moon, Joel Nelson, Geni Skendo, and Ladonna Smith. In addition to our composer-performed works, this event will include performances by Craig Hultgren (cello), Osiris J. Molina (clarinet), Jacquie Cotillard (saxophone), Charles Pagano (drums), Scott Bazar (bass), Brad Davis (electronics), and Davey Williams (guitar). On Friday, October 19, 2018; at 8 PM, we are happy to present a program in the Plaza of the Hoover Public Library. Composers include Michael Coleman, Shawn Crouch, Monroe Golden, David Mecionis (New York Composers Circle), Matthew Scott Phillips, Tom Reiner, Alan Schmitz, and Geni Skendo. Performers for this event include Trent Bradford (highland pipes), Angela Flaniken (viola), Maurice Nix (bass vocals), Seth Noble (vibraphone), Craig Hultgren (cello), Geni Skendo (flute), and Brian Viliunas (clarinet). On Saturday, October 20, 2018; at 6 PM, join us for an evening of spontaneous and pre-meditated improvisations by BAMA members. There will be solo, duo, trios and group improvisations using Shakuhachi, Shamisen, Electric Saxophone, Bass Flute, Electric Sitar, 5 string Viola, Electric Bass & Percussion. Performers include Geni Skendo, LaDonna Smith, Andrew Raffo Dewar, Davey Williams, and special guests. On Sunday, October 21, 2018; at 2:30 PM, we are proud to present the BAMA Players, a lineup of first-rate professional musicians from the Birmingham area, playing music by local composers in beautiful Brock Recital Hall at Samford University. Composers include Bunny Beck (New York Composers Circle), Joel Scott Davis, Kenneth A. Kuhn, Mark Lackey, Joseph Landers, W. F. Smith Leithart, Matthew Scott Phillips, and Tom Reiner. The performers for BAMA Players are Hillary Tidman (flute), Kathy White (clarinet), Adam Alan Bowles (piano), Sarah Dennis (violin), Pei-Ju Wu (violin), Meredith Treastor (viola), and Laura Usiskin, cello. View the Events section of this web page for more details about program details, event times, and event locations. We hope you will join us!